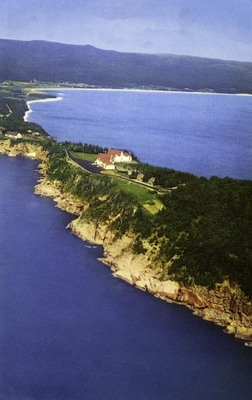 "Cape Breton – The Keltic Lodge"
Aerial view of the Magnificent Summer Resport, The Keltic Lodge, Ingonish, Cape Breton, on the Cabot Trail. One color postcard with a divided back. The postcard was published by John Urquhart Wholesale in Sydney, Canada with color by Mike Roberts in Berkeley, California.